Indian Army Has recently Published The recruitment rally 2018 for the posts of Soldier General Duty/Soldier Technical (Nursing Assistant)/Soldier Technical/Soldier Clk/SKT/Soldier Tradesman various posts .Online registration is mandatory and will be open from 30 August 18 to 13 October 18. Admit Cards for the rally will be sent through registered e-mail from 14 October 18 to 28 October 2018.Army Recruitment Rally will be held for eligible candidates of districts Hojai, Biswanath, Nagaon, Sonitpur & Morigaon from 29 Oct 2018 to 03 Nov 2018 at Solmara Military Stadium, Tezpur.Online registration is mandatory and will be open from 30 August 18 to 13 October 18. Admit Cards for the rally will be sent through registered e-mail from 14 October 18 to 28 October 2018. 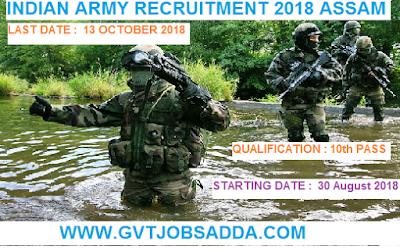 Those candidates who are interested in this posts they can apply before last date brief information mention below please visit official Indian army website before online registration. (a) 10+2/Intermediate Exam pass in science with Physics, Chemistry, Biology and English with 40% marks in these subject and 50% marks in aggregate. 10+2/Intermediate Examination pass in Science with Physics, Chemistry, Maths and English with 40% marks in each subject and 50% marks in overall aggregate. 10+2/Intermediate Exam pass in any stream (Arts, Commerce, and Science) with 60% marks in aggregate and minimum 50% in each subject. Should have studies and passed English and Maths/Accounts/ Book Keeping in class X or Class XII with 50% Marks in each subject. For more detailed information about Educational Qualification & Age limit in Indian Army Rally 2018 Recruitment candidate can check the Official Notification.